To achieve its goal of generating 40 per cent of electricity from non-fossil fuels by 2030, India would have to install 500 GW of renewable energy generation capacity by 2028, according to the Secretary of its Ministry of New and Renewable Energy, who was speaking at an international summit that opened yesterday in New Delhi. All this is happening in a country that believes that 100% renewable energy possible ? Of this 500 GW renewable capacity, 350 GW would be from solar. India currently has installed renewable energy capacity of 75 GW with a further 46 GW under implementation. In the meantime, the GCC countries investment in renewables could reach $16bn by 2020 thus showing great promise for renewable energy deployment in the region by then. In one of the capitals of the MENA’s fossil fuel countries of the Gulf, the economics of solar power versus gas-fired power generation are less obvious. The UAE aims for solar to account for 7 per cent of all the country’s generated power by 2020 as solar energy is planned to play a vital role in GCC’s push for renewables. Not only that, it is also believed that renewable energy could however offer Gulf countries a proven, home-grown path to reducing if only their carbon emission; the six GCC countries are in the top 14 per capita emitters of CO2. 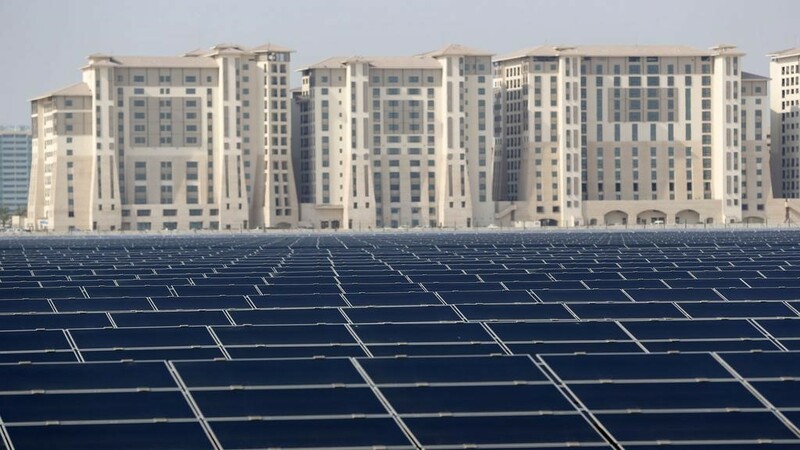 ABU DHABI: Abu Dhabi Future Energy Company (Masdar) plans to double its renewables energy capacity in five years with new projects in Asia and the Americas, its chief executive said on Monday. Masdar, wholly-owned by Abu Dhabi’s Mubadala Investment Company, has till now invested $8.5 billion to build capacity of 4 gigawatts (GW) in renewables projects in the United Arab Emirates, Britain, Seychelles, Spain and the Middle East. “We are a growing company, we will be doubling our capacity in the next five years or less. We are pursuing opportunities globally and will be entering new geographies in Asia and the Americas,” CEO Mohamed Jameel al Ramahi told Reuters. Abu Dhabi, like other Gulf oil producers, wants to reduce reliance on crude. Neighbouring Saudi Arabia, the world’s biggest oil exporter, has also launched a $50 billion renewables energy push. Masdar would bid for solar and wind energy projects in the kingdom, al Ramahi said, speaking before the World Future Energy Summit in Abu Dhabi on Jan. 14-17. The 12-year-old company is a preferred bidder for Saudi Arabia’s first wind farm project at Dumat al Jandal in the northern Al Jouf region. The project will have 400 megawatt (MW) capacity. Masdar is part of the EDF Energies Nouvelles consortium bidding for Morocco’s Noor Midelt solar power project, al Ramahi said.